The average person uses 25-40 gallons of water per day. But the environmental problem isn’t just the water itself, but rather the energy needed to heat the water in question. With just a few simple tricks, you can save a lot of water and energy – and that’s money in your pocket! Hot water is the second largest energy demand in modern households, making up nearly 12 percent of total energy usage. We’ll show you how to save hot water costs around the house. Take showers instead of baths to save gallons of water. Modern low-flow showerheads reduce water usage to just 1-2 gallons per minute; to fill a tub, you’ll need 35 gallons! Low-flow showerheads, faucet aerators, and single-handle faucets are all methods of reducing hot water usage. That said, you still need to turn off the tap while brushing your teeth or shaving! When buying washing machines and dishwashers, pay attention to their water and energy usage statistics. Modern machines use fewer than 15 gallons per load of laundry or 3 gallons per load of dishes; older machines guzzle triple to five times that amount! If you have a dishwasher, don’t wash dishes by hand. A fully-loaded dishwasher uses less water and energy than handwashing. Remember that you don’t need to rinse your dishes first; a well-maintained dishwasher gets all dishes clean! Don’t clean your greens under running water. Instead, use a pot or pail to wash all of your fruits and vegetables. At the end, use the graywater to water your house or garden plants. 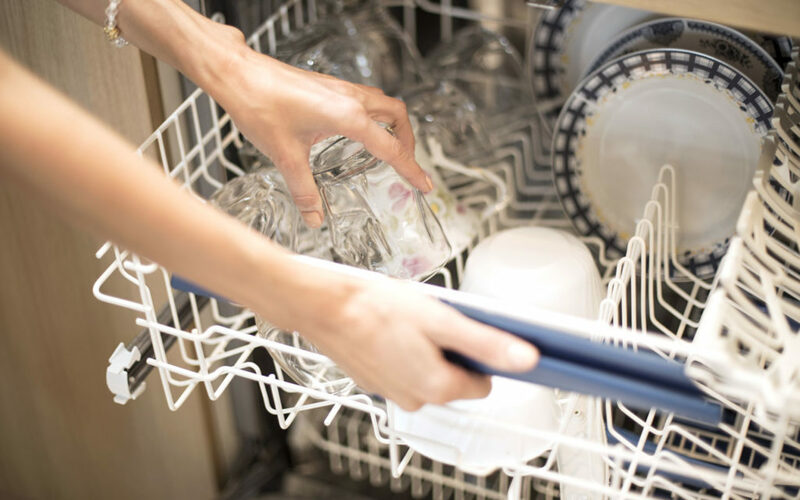 Always make sure to run full washer and dishwasher loads, in order to avoid using too many resources when cleaning just a few dishes or items of clothing. Pressure washers use over 100 gallons of drinking water per hour! Using traditional methods like a bucket and a rag saves not only water, but may also be more efficient at cleaning than using an appliance. Always start by washing the least dirty dishes first. You can then “recycle” the remaining water for washing even dirtier dishes, or even to mop your floors, before sending it down the drain.